I now realize the shortcomings of that philosophy. In Southern California, you just need to get a young avocado tree through its first couple winters and then it can withstand all but the rarest and coldest arctic blasts we receive. And adding a couple degrees of warmth on a couple nights each winter is usually all it takes. 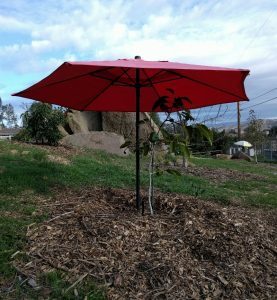 This post is about when avocado trees need cold protection, what protective measures I’ve tried in past winters, and new methods I will test this winter, if necessary. 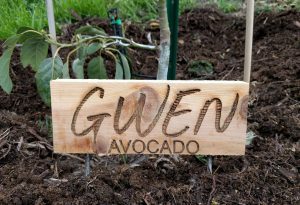 At what temperatures do you need to protect avocado trees? I have a thermometer on my porch where I estimate that the temperature stays around 4 degrees warmer than out in the open parts of my yard. 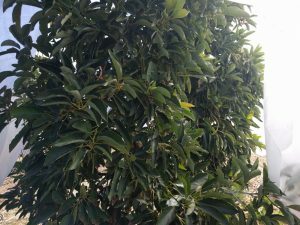 Over the past handful of winters, I’ve recorded some of the low temperatures on that thermometer along with damage caused to avocado trees. 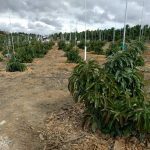 Damage to young and small avocado trees, roughly younger than three years in the ground and under five feet tall, or unhealthy avocado trees can happen once the temperature drops below freezing, 32 degrees. 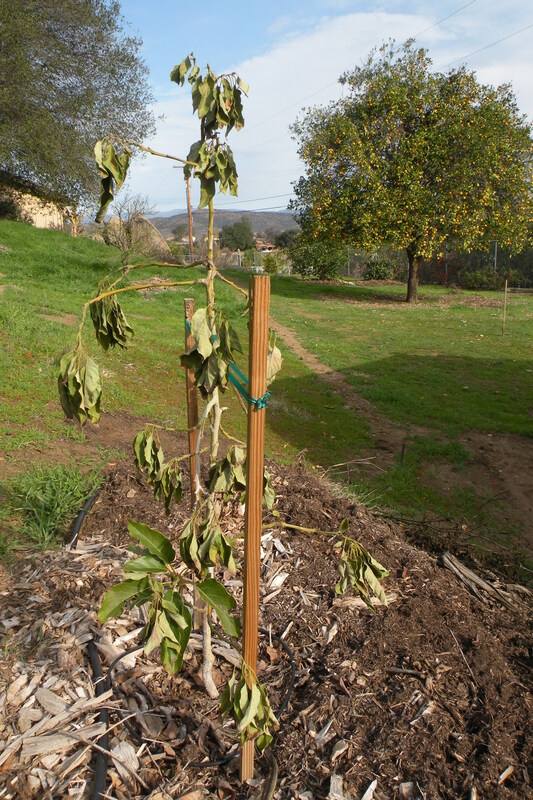 But I’ve never seen damage to mature and healthy avocado trees until the temperature drops below 30. This is the threshold for observed avocado damage in my yard. 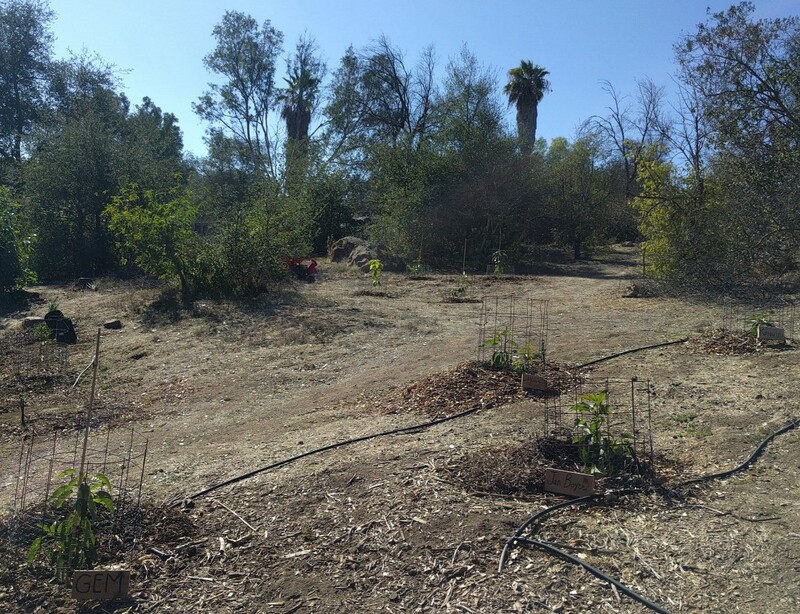 On the day after Christmas in 2015, the yard got down to 29 and I noticed a couple of newly emerged leaves on various avocado trees partially burned. There was frost on the ground throughout the yard that morning. 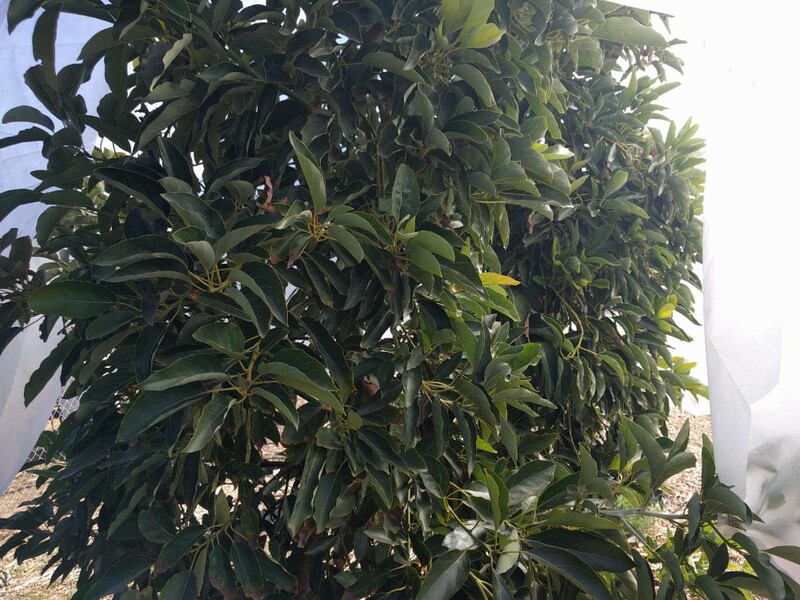 In late February of this year, 2018, the yard got down to 27 and new leaves on avocado trees were damaged, plus some older leaves showed brown mottling, and most flowers on all of my avocado trees were killed (except some deep inside the canopy). The frosty photo at the top of the page was taken during this event. During the last days of 2014 and the first days of 2015, the yard got down to 26. I refer to this event as the New Year’s Freeze of 2015, and it remains the lowest temperature reached in my yard during the five winters I’ve spent here. 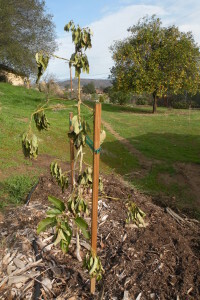 Damage to my avocados was widespread although not serious except to young trees. The Pinkerton, after suffering many hours in the mid to upper 20s. 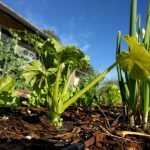 Related to the soil’s ability to store heat and radiate it later, I’ve read advice to remove mulch from beneath the tree since mulch blocks soil from warming as much as possible. This might make sense. 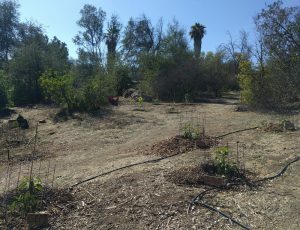 I’ve observed the pattern innumerable times in my yard and neighborhood where, during light frosts, mulched (with wood chips or compost) areas are covered by frost while adjacent bare soil is not. Even so, last winter I experimented with removing mulch from below some of my trees and found unclear results. During the frosty nights of late February 2018, some mulched trees were damaged, some were not. Some unmulched trees were damaged, some were not. I don’t know what conclusions to draw from this, honestly. Now for what to do to protect your avocado tree during a frigid night. A small tree is easily protected by putting a roof over its head. Any overhead covering is warmer than nothing. I’ve used blankets and rugs. 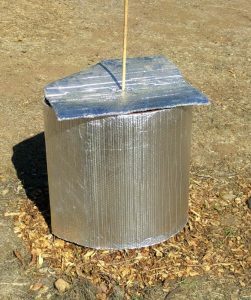 I’ve also used nylon tarps on top of ladders set over the tree, trash cans, cardboard boxes, and more. I’ve seen that they all keep the tree at least a few degrees warmer, in part as judged by the frost forming on ground near such protected trees but not under them, in addition to their sustaining no damage. How does overhead protection work, and how to use it? The way this method works is by trapping radiation that emanates from both the tree and the soil below the tree. At night, the tree and soil are releasing a certain amount of heat into the air, and if you can block that radiation you can keep the temperature around the tree higher than it otherwise would be. Higher by how many degrees? I’ve read estimates of 4-8 degrees. It seems to depend on the materials used. Regardless, even if it’s only two degrees higher, a young tree kept at 31 compared to 29 can mean the difference between no damage and all leaves lost. Will you trap even more heat by wrapping the sides too? Sure thing. It’s like the difference between sleeping under a mere tarp and sleeping in an enclosed tent. The above photo shows a young avocado tree wrapped in Reflectix bubble insulation (see it on Amazon here). I happen to have some of this material on hand so I’ve used it to protect trees in winters past. 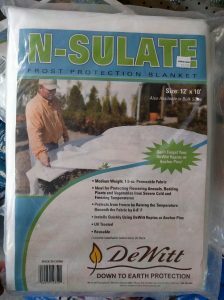 Another material that is deliberately made for insulation, but this time specifically for insulating plants, is a frost blanket such as this one. I bought this N-Sulate frost blanket at a nursery for $13. It’s also available online, such as on Amazon here. 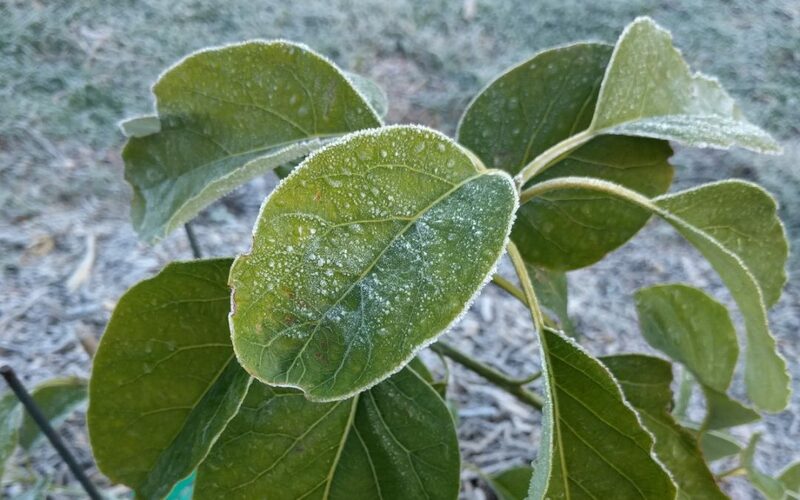 Frost blankets can entirely wrap a small tree, and if they do, blankets of this weight (1.5 ounces per square yard) claim to be able to give 6-8 degrees of protection. But they can also give somewhat less protection if used to partially cover a larger tree. 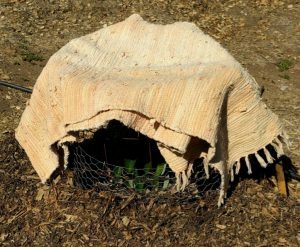 I’ve got a good crop of fruit on my Lamb avocado tree that I don’t want to lose, so if temperatures threaten to damage this fruit I’ll throw the blanket over it like this. I secured the frost blanket to small branches using clothespins. View inside the frost blanket. 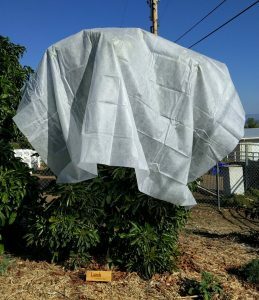 By the way, if you had a couple of smaller avocado trees that you wanted to protect, you could completely wrap them with a pack of smaller frost blankets, such as these 7’x7′ ones made by Agribon, available through Peaceful Valley Farm Supply (Grow Organic.com). An additional way to add warmth to a larger tree is the classic Christmas lights approach. 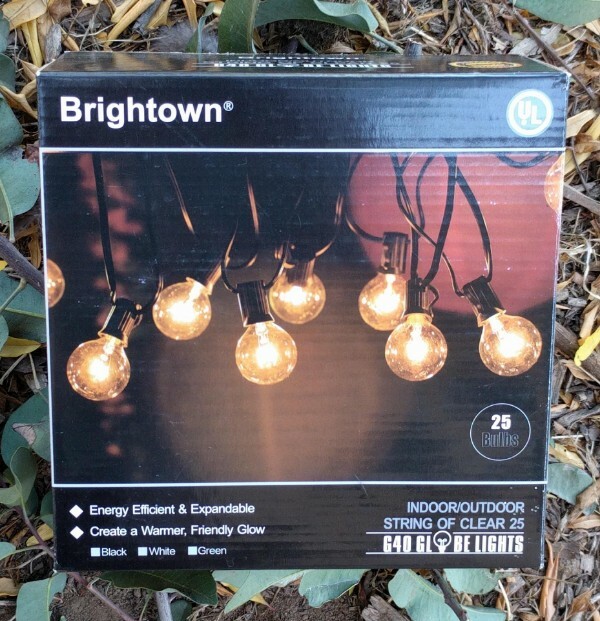 Run an extension cord out to the tree, then string Christmas lights (or similar lights) through the tree. Leave the lights on all night, especially through the early morning when it’s usually coldest, to add a few degrees of warming. Here are some lights that would work for this purpose: Brightown Globe String Lights (here they are on Amazon). Note that they are incandescent and not LED, which wouldn’t give off the desired heat. I set them up for a show on this Nimlioh tree. 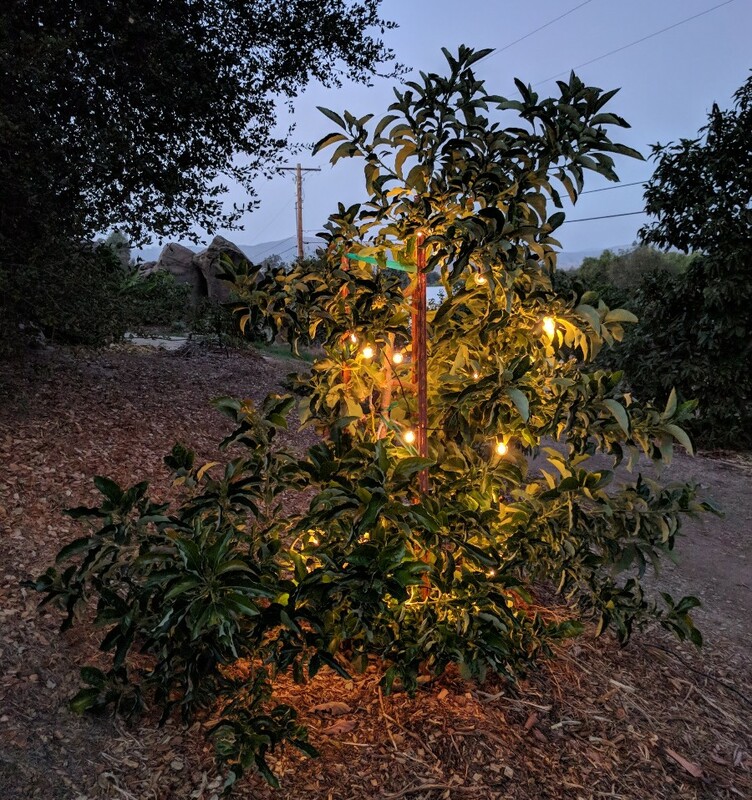 Of course, you can use lights on small trees as well. In fact, both covering a tree and turning lights on under the covering adds maximum heat. You can also use other sources of heat placed below the tree, such as a shop light, a table lamp, or a space heater. Some people claim that you can get some protection by leaving buckets of water under or next to the tree. When water freezes it releases a small amount of heat. I tried this one night a long time ago and found no effect compared to nearby trees that spent the night bucketless. I’m not convinced it is effective, especially compared to other techniques. –Any overhead coverage raises the temperature around the tree a few degrees. 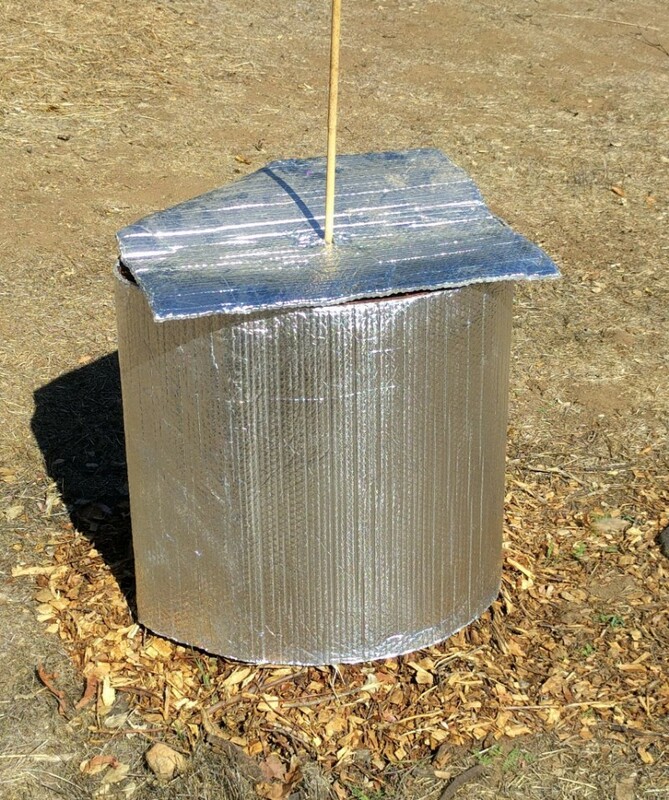 –Overhead plus side coverage keeps a tree even warmer. –Lights strung in a tree add warmth. 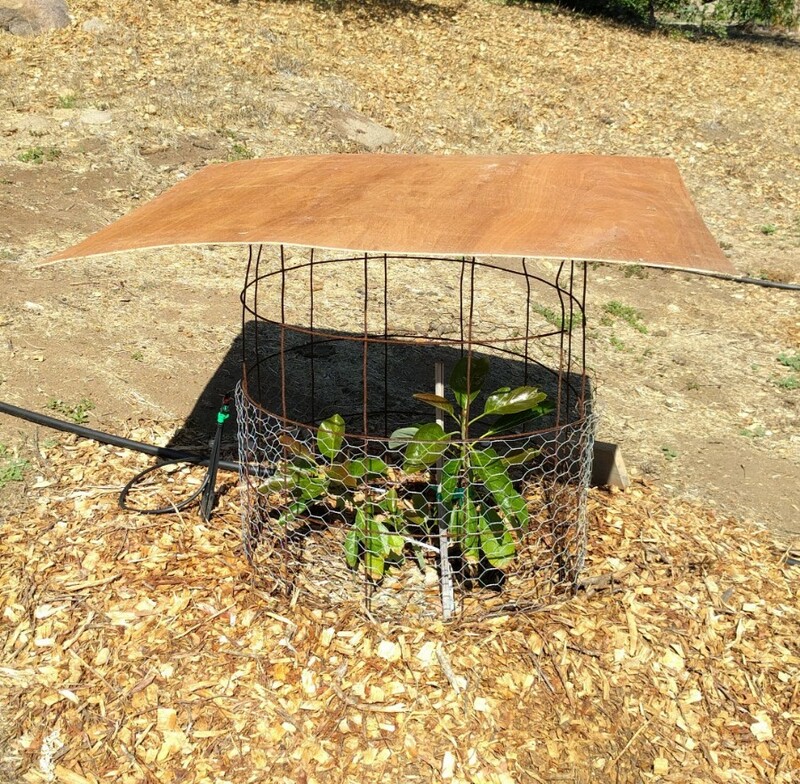 –Lights or other heat within a covering would add maximum heat and protection of an avocado tree in the cold. When a winter night gets cruel and it’s below 40 already at dinner time and protecting your avocado tree is called for, is it worth the effort? Yes. I’ve lost young trees in the past that I might be eating from now if only I’d thrown a little protection over them on one or two nights. Prepare now. Have the materials on hand. This advice is directed at myself as much as anyone, for I’m especially exposed to the cold this winter as I’ve got more small young avocado trees to shepherd than usual. Can we please get a warm and rainy winter like 2016/2017? Wish me luck, I wish you luck. Up the hill we plant. The winter certainly was rainy but it was not warm. The coldest night in my yard was February 19 when the thermometer dropped to 27. Fortunately, I didn’t lose even the tiniest of avocado trees. 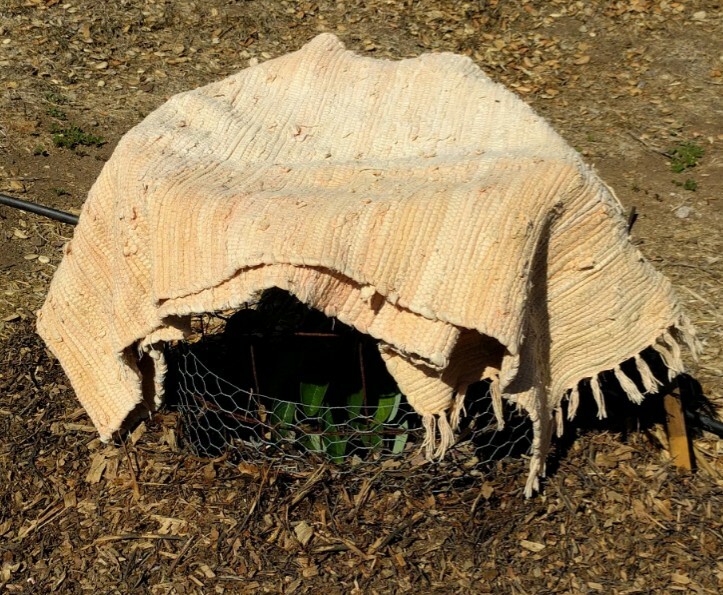 Mostly, I protected them with frost blankets (Agribon AG-50, as seen here). A few trees I helped with only umbrellas, and for a couple young trees I added heat with lights. You provide such great information which has helped me a great deal! What are your thoughts on good old fashion smudge pots? I had a neighbor give me a few and was thinking of using them this winter if necessary? Thanks, John! I’ve never used smudge pots myself. They obviously work though. I guess their effectiveness for you might depend on how many you have and how many trees you’re trying to warm with them. My understanding is that each smudge pot only warms a small area. Probably, for the time and money spent, other methods would be more efficient and effective, but then there’s nostalgia . . . If I had one, I might light it up one frosty night just to see what it felt like to be trying to save a Washington navel orange crop back when Riverside was the citrus capital. Thank you for the prompt response! I’m concerned about two trees which I planted this past spring! A five gallon Carmen and a fifteen gallon Sharwil. I’m thinking of placing a smudge pot near each one since they are both so young and vulnerable. 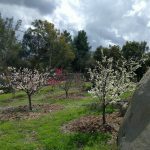 My other trees are more mature and seem to have more trouble with the extreme heat than the cold – especially this past July! 2 Reeds, 2 Sharwil, 1 Carmen, 1 Lamb, 1 Sirprize, 1 Pinkerton, 1 Hass, 1 Jan Boyce, 1 Zutano, 1 Fuerte. I’m really looking forward to growing watermelon and cantaloupe under the canopy as you have suggested! What month would be best to plant the seeds? What a fantastic avocado portfolio you have growing there. I’ve heard from other inland growers that Carmen only produces one significant crop here. Mine is young like yours, so we’ll see in my yard. Let me know how yours ultimately performs. This past summer I planted melon seedlings under avocados on June 27, and they performed well. That would mean sowing the seeds in early May. 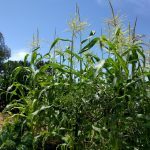 You could certainly safely sow/plant a bit earlier than that too, but mine often get more bug damage if I plant them out much earlier. I use the wire cage you show in a photo. Only mine is 8’ tall and I make them about 36” to 40” in circumference. I use a clamp light near the base facing upwards to the center of the tree. A 60 watt old style bulb or even a spot light type can give more heat. That Pinkerton in the photo above did survive, yes. It grew back fairly well the following summer.